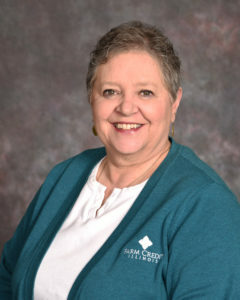 Bonnie McGrew is retiring from Farm Credit Illinois May 31, after 36 years providing support to generations of farm families in the Champaign area. McGrew is a senior sales and service specialist based at the Mahomet regional office serving Champaign, Douglas, Ford, Piatt, and Vermilion Counties. McGrew was raised in Ford County. Before joining the workforce, she studied at Northern Illinois University. During her Farm Credit career, McGrew was based in Paxton, Gibson City, and Champaign offices, before moving to the newly purchased cooperative headquarters and Mahomet regional office in 2008. McGrew and her husband Lance have one daughter – Holli Applegate – and two grandchildren – Austin and Arin. The Farm Credit Illinois team is grateful for McGrew’s leadership and service to farm families and rural communities.